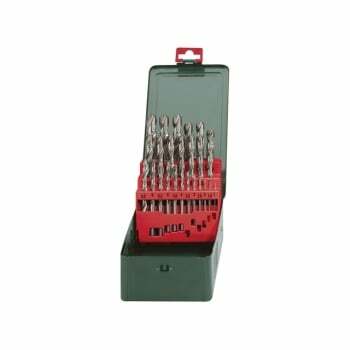 The Metabo HSS-G Drill Bit Set suitable for drilling steel and cast steel, alloyed and unalloyed, grey cast iron, malleable cast iron, ductile cast iron, sintered iron, nickel silver, graphite, non-ferrous metals, and plastic. 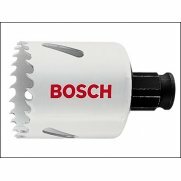 Up to 900 N/mm² tensile strength. 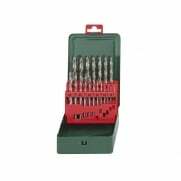 The bits have been ground with a cylindrical, DIN 338, type N, 135° crosswise grinding tip. 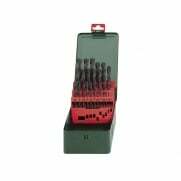 They are supplied in a metal tin and it contains one of each size: 1, 1.5, 2, 2.5, 3, 3.5, 4, 4.5, 5, 5.5, 6, 6.5, 7, 7.5, 8, 8.5, 9, 9.5, 10, 10.5, 11, 11.5, 12, 12.5 & 13mm.